Often overlooked when planting trees is the damage caused by vermin, of which the chief culprit is the rabbit. In addition to the rabbit is the vole which eat through the stems of small trees. In recognition of this fact, our 0.6m (2ft) economy tree guards are designed to offer cost effective protection for trees against this damage. 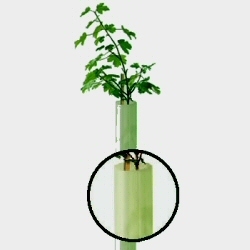 Other beneficial properties that tree guards offer are that they accelerate the vertical growth of the trees and protect the leaves of the trees against weedkillers which can be carefully used around the base. Extreme care is required in using all weedkillers so that their spray drift does not land on the trees. The design of these shelters allows for maximum light penetration and provide a micro climate for the trees which results in better initial establishment, stronger roots and higher survival rates. They also retain moisture, reducing water stress on the tree and are suitable for our smaller plants that are less than 60cm tall. DOES NOT COME WITH CANES AS IT IS CHEAPER TO SOURCE LOCALLY. Best suited for non-hedging species, we recommend our economy tree spiral guards as being more suited for branchier hedging species. Of many other animals causing damage to trees, deer and the hare are worth consideration in terms of an appropriate tree guard. Of course many animals will cause damage to and eat trees. Some common pitfalls are planting hedges too close to a fence where livestock can reach over and eat the trees. We would recommend that a hedge is planted and kept at least 1.5m from the hedge are so to avoid this.